Stella Arnaldo's Blogspot: What a waste! 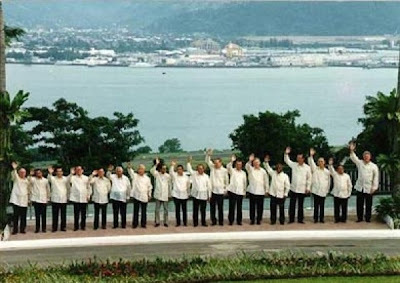 ON Nov, 25, 1996, the Subic Bay freeport in Zambales, Philippines, played host to the 4th Apec Leaders Summit. It was a crowning achievement of the Subic Bay Metropolitan Authority, then headed by administrator Richard Gordon, who showed off how the Philippines was able to transform a former U.S. military naval base, into a commercially viable center for business and tourism. 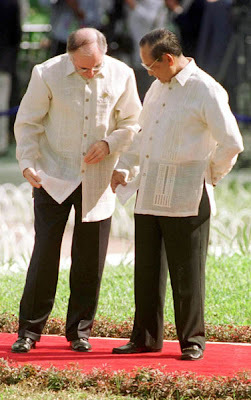 The Philippine government wasted no expense in renovating a conference site called Summit Hall where the 18 heads of state including U.S. President Bill Clinton, Malaysian Prime Minister Mahathir Mohammed, Brunei Sultan Bolkiah, Indonesian Prime Minister Suharto, Australian Prime Minister John Howard, among others, would be able to meet and thresh out issues to further push cooperation among their countries. About 21 luxury villas costing $1 million each, where the leaders would be able to retire after their meetings were done for the day, were built as well. About $12 million was reportedly spent to renovate the Summit Hall and nearby Crown Peak Garden Hotel. Both are located in the Upper Mau area of the freeport. I don't remember any head of state actually staying in the Villas built for them, which has since been renamed into Triboa Bay Estates, and were being sold to private individuals at a cost of P50 million each. (One of those villas were said to have been donated to a head of state (wink!) after the Summit was over.) Apparently there have been no takers for most of the villas that the last listings from real estate brokers put the villas at P30 million. I recently read a report by Home Guaranty Corp., a government-owned corporation which has apparently taken over Triboa Estates/Apec Villas, stating that the 3rd bidding for the repair/rehab four of the villas were declared as failures in 2007 and as such were up for negotiated procurement. Tsk, tsk.